Whew! What a busy couple of weeks. We've been talking about Joey getting his own welder for a couple years now, and the opportunity came for Joey to get a nice shiny red welder to match his nice shiny red truck, so we took it. Now the Nebraska job is no longer good enough, it's getting colder, and we have people to see and places to be. We spent the first night back on the road in a Wal-mart parking lot after meeting Joey's friend's wife at their storage unit to get the leads that go with the welder.The kids and I decide to grocery shop at midnight so I wouldn't have to deal with saturday morning christmas shoppers. Shopping is a breeze in the middle of the night, unfortunately all the leisurely strolling down the aisles is painful on the budget. Oh well, at least now we're all set for a great road trip. We stopped at a park in Osceola, KS for lunch and ended up spending a huge part of the day there. Even Joey couldn't resist the slides here. We pull into the Fast Stop in Minneapolis, KS just as the bus runs out of gas. Whew! What luck!I hand over Joey's paycheck, run back to the bus to get a band aid for a lady in the store and realize the bus won't start! Joey says it just needs to get the diesel into the fuel lines, it'll be fine. I go back inside to get the phone book. I ask the girls inside if they know any diesel mechanics. In walks boyfriend, he calls a friend, who calls a friend and as soon as I come out of the store there's a nice young guy offering to help Joey. They fiddle for a bit, thankfully the clerks don't mind one bit that we're taking up two gas stalls completely and blocking easy access to two more. Young man can't fix it, he leaves to get someone he knows that can and within five minutes he's back with an older gentleman that proceeds to give Joey a complete lesson on our engine. They fixed it in no time and then would not accept any money! Not only did we save hundreds in towing and repair work but Joey got priceless info for future mishaps! That my friend, is unschooling on the road. What a Xmas gift! We Google Earthed my parent's new place to familiarize ourselves with the layout so we could plan a sneak attack. It worked. They weren't even moved in yet. I called my mom and in usual fashion she asked "Where are you?" Sitting in your jacuzzi...surprise! :) They hurried home, bringing my brother and his family with them. It was so good to see everyone, it had been about nine months since we'd seen them. We also got to tour the bro's new mini mansion, where my folks grabbed their toothbrushes and headed back to their acreage with us. We all agree it's a good thing my mom and brother never cut the umbilical cord, Fort Worth is so much more convenient for us, being centrally located and South. Mom and I had a whirlwind week of non stop christmas shopping, or at least what seemed like it. My mom's cousin, Diana, came over from Dallas to visit, and do more shopping. Her and husband, Rick, came over for Christmas Eve as well and brought some cool gifts. She got Joey a DVD game by The Discovery Channel called Road Trip America. We spent hours in the bus that night with all five of us playing it. I was a little surprised when my five year shouted out South Dakota for the answer to Where is Mount Rushmore? She hasn't even been there herself! We're really enjoying this carefree life on my parent's property but we do have to figure out our next move soon. I'm sure we'll know more after this weekend. I'm reposting this video by two homeschool brothers, because they're right...they're hella tite! We're still in Nebraska. I guess I feel I have to say that because people that know us, know that we don't stay in one place for too long. We're planning on staying here all winter, though. That's the plan, at least. We spent Thanksgiving with a fellow road dog and his wife at their rental house. Joey really had to sell me on going there, next year I won't be buying. We absolutely enjoyed the rest of the weekend, though. We got a burst of energy and started remodeling and reorganizing. We took down the temporary bunks we had made for the boys and built them big new bunks, the full length of the old closet. 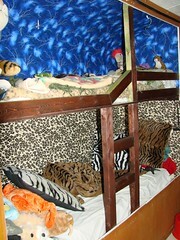 We also made the frame for the foot of our bed so we can turn our full size bed into a king. We still have the side frame to build, new cubicles/drawers for our clothes, and mattress to buy, but we're off to a great start. For the bunk beds I glued material to the walls, and for the frame we used 2x3's, stained a red mahogany (which I'd eventually like to convert all the wood into the bus to). I had to drive all the way to Iowa again. I thought I could register our new cars just over the border in Iowa, but no, they have to be registered in the county of residence. For residency purposes we're still using our house in Fonda. Knowing this area all too well you wouldn't think I'd go 100 miles out of my way, do you? Oh, you do know me, yes I did. I missed a turn early on and never thought twice about it, until I saw I was 12 miles from Minnesota! I got the cars registered with one day to spare, gotta leave room for error. We then swung by Mel's to pick up our mail and then hurried back to the Bus to beat the roads from turning to ice. This last weekend we made YET ANOTHER trip to Iowa....to pick up Joey's Jeep. Jeep? What Jeep? I thought you sold it, you ask. We got it back. Heck, we had an extra hitch, may as well tow something with it. While we were gone this day our breaker decides to go out leaving the bus without any heat all day long. We came home to a frozen black tank, that was extremely full! Good thing we knew the temps were dropping and picked up a bigger radiant heat heater on the way home just to put under the bus. Joey ended up having to take the next day off work to deal with the frozen tank but eventually the heater thawed the tank out and we were able to drain it. We also ran out of propane! The propane guy came the next day around noon and we were able run the furnace again. We made it thru a 9 degree night with just two small electric heaters. While the heaters do an excellent job heating the bus there was still a huge cold draft coming form the windows, so yesterday I bought insulation that is basically bubble wrap wrapped in aluminum foil and covered every window with it. It has stopped the drafts completley. It truly is amazing at how well the bus stays heated now. The furnace hasn't kicked on at all, and last night I only had one heater running on low, and it was very warm. We're pretty confident now we can hang out the winter in comfort.